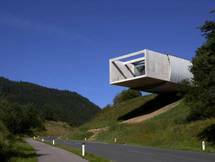 querkraft is an Austrian architecture practice founded in 1998 by Jakob Dunkl, Gerd Erhartt, Peter Sapp and Michael Zinner who left in 2004 to devote himself to training architects. Helmut Richter who was their teacher at the Technical University had a major influence on the trio. Richter applies the structural aspect aesthetically, with the impact of the aesthetics being underscored by the choice of unusual materials. These include so-called banal materials not usually used in architecture - such as the canvas covers used on trucks, formwork boards, wire gauze, and corrugated metal. querkraft never tires of reasserting how much they respect Richter and how much they have learnt from him. The querkrafters first managed to grab the limelight with a Richter-style approach for a sun-sail at a street cafe in Vienna: Sailcloth was used in a cleverly constructive way - the solution was not just efficient but also inexpensive. The use of sailboat equipment later became a fashion, and fashion is not what querkraft is about. They look for and deliver individual solutions. They do not strive for a recognizable signature, nor an image all of their own unless, that is, it is one of calmness both in their way of working and in the language their buildings are made with. Composure reigned at the beginning of their career as well in terms of building costs, not upward, however, quite the contrary, downward. The more limited the budget was, the easier time they had - or so it appeared. You can see from the buildings that they must have cost little to build, yet they never look cheap. If anything quite the opposite: they are rather complex, with lots of thought going into the conception and design phase. The finished buildings provide a sense of this and likewise the long communal discussions which preceded the designs. In the beginning designing is a verbal process - instead of finding a democratic solution querkraft keeps on discussing until everyone agrees.